"[Pilates] is complete coordination of body, mind, and spirit." Pilates is great for just about anyone and everyone! 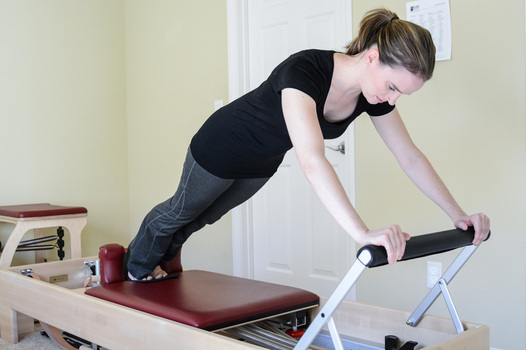 Whether you are suffering from back pain, seeking to enhance your athletic performance, regaining strength after an injury, or simply looking for an exercise program that will help you look and feel great, Pilates is right for you! What are some goals of Pilates? Joseph Pilates, an innovator of therapeutic exercise from Germany, believed that "physical fitness is the first requisite of happiness." He developed the Pilates method (which he originally termed Contrology), a system of movement and therapeutic exercise, with the goal of enabling people to become physically fit. Joe Pilates teaching an exercise on the reformer. What is the equipment for? The Pilates method includes both exercises on the mat (without equipment) and on various apparatus (equipment). Pilates invented equipment to help his students develop the strength, flexibility, and coordination to attain complete control over their bodies. Once you learn a new skill on the equipment, you can take that skill into the mat work as well as into the rest of your life!